This entry was posted in Court Records, Morningside Hospital, Patient Burials, Patient List, Research Project News and tagged demographics, Patient List, patients. Bookmark the permalink. Post a comment or leave a trackback: Trackback URL. My sister spent some time in Morningside in the mid 1960s but doesn’t appears to be on any of the lists so far. Is this due to patient privacy or are the records from the mid 1960s (1962 to 1966) unavailable? The records are the least complete from 1948 through the 1960s. Unfortunately, we haven’t found any of the Quarterly Reports from that period. The records will be added if we ever find them. Thank you so much for the time and energy put into this project. I did find my mother’s name in the records. Any information that is available pertaining to her would be appreciated. Her name was Genevieve Rogers and spent time at the hospital in 1956 and 1958 as far as I know. Again! Thank you from my family. I just found the website and discovered a lot of people who came from the same area my Scandinavian great grandfather met my Russian/Native greatgrandmother in during 1891. At least one name on the list was a relative. I want to know what was the definition of “criminal” and “insane” in the eyes of the doctors? There’s an earlier post on the blog that talks about the legal process people went through before they were sent to Morningside. Jean, all of the records we’ve found so far are part of the online database. 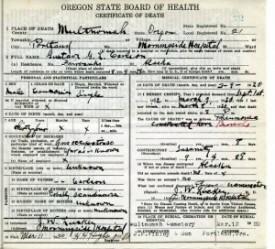 We’ll keep looking for the mother lode (the actual patient records) but I think they were destroyed, either in Portland or Alaska. I found my sister who was taken from alaska to morning side in May 1955. She is alive and living in Kenai Alaska with a care taker. We have searched for her for years, we are so happy to have found her. Genevieve was returned to Morningside Hospital 11 Dec 1957. Genevieve passed away 5 Apr 1958. Second stay in Morningside and Good Samaritan Hospital = a little over 6 months before she passed away.